Are you ready for more crackles? I dunno, I just wish companies would be out to find the next new best thing instead of following what everyone else is doing. Although I most likely won't be getting any of these, I just wanted to let everyone know what's coming soon. Will you buy any of these? Create dramatically different looks withjust one sweep of China Glaze Crackle Glaze Metals. Layer over differentbase colors to create bold styles. Use a lighter coat to create a finecrackle, a thicker coat for a deep shatter effect. As versatile and edgyas China Glaze’s biggest celebrity fans (Lady Gaga, Rihanna, NicoleRitchie and Kelly Osbourne, to name a few), Glaze Crackle Glaze Metals is sureto be this summer’s hottest beauty trend! 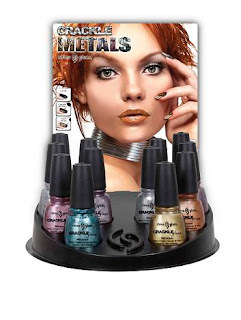 The China Glaze CrackleGlaze Metals collection will be available as open stock colors and 12 piececounter display with a unique Crackle Glaze screen and including aninstructional hang tag. China Glaze is free of DBP,toluene, and added formaldehyde. I might get the gold. I'm excited about the new finish though! Metallics are my fav. Meee I will! I'm sick of crackle too, but I like the metallic finish and want to try that out too. And if it doesn't work, I can always trade it away or something. I always say that I won't buy anything from a collection, but I always do! I am happy they decided to go with a different finish instead of the normal creme (and matte without a topcoat). Thanks for the comments!